Unbeatable power in a Low Profile package! 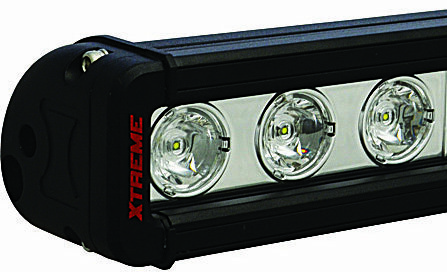 Rest assured that the LEDs inside of the Xmitter Low Profile Xtreme are the best 5-Watt LEDs obtainable. Top-binned and perfectly constructed, these high powered LEDs are capable of outputting 528 raw lumens each. The Xmitter Low Profile Xtreme LED Bar excels at mounting into tight spots where normal bars wont cut it. By having a shallow mounting depth, the Low Profile Xmitter is able to provide powerful light output without being too bulky or distracting when mounted on your vehicle.